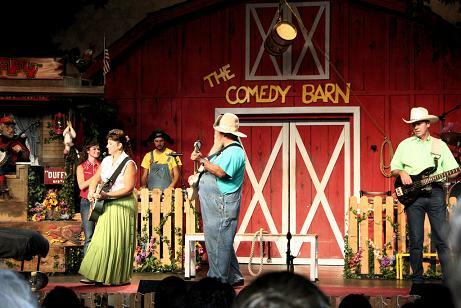 The Comedy Barn is an excellent award winning comedy-variety show. It offers up some serious down home humor, rated family friendly fun for all ages. Remember years ago when simple clean and fresh off the farm humor was customary in America? Well this show blends it all together, complete with country comedy, jugglers, fire-eaters, ventriloquists, magicians and several cute animals. One of our favorite parts of the show is when they choose people from the audience to participate in songs and skit routines. It makes this show worth seeing again as it is never quite the same twice. You just can’t plan for what might happen when you give adults and kids a some live stage time. The cast members are good about spreading out the calls, as kids in the front sections as well as some further back will have an opportunity to be on stage. However, if you really want to participate I would suggest that you arrive early and ask for seats front and center. Plus, seats fill up pretty fast, and it's first-come first-serve for tickets. Overall, the Comedy Barn in Pigeon Forge offers clean family comedy for a very enjoyable evening. I even caught our teenager bent over laughing a few times, and I haven’t laughed so hard at any show in my life. Even the youngest ones will laugh at the dogs and other special acts especially for them. We all really enjoyed the show from beginning to end, and everyone in the audience appeared to be having a really great time. If you or one of your family members does participate in the show I would recommend purchasing a copy of the DVD they tape during every show. It’s great to have for lasting memories! We bought the video and the kids watched it as soon as we got home. Overall, for the price, the Comedy Barn is a great value, but be sure to ask about discounts if you're a military member, senior, or some other special group. We saved at least $10 using coupons from one of the local advertising magazines that are available just about everywhere. Plus, children 11 and under get in free with a paying adult. Have a great time!